There was much laughter this morning when the boss came into the office, as she let everyone know that she had seen the "discussion" about bellybuttons while she was working from home! So following on from yesterday's frivolities, I sent out another email this morning, this time including a yummy pic of Chris Jericho. And no, I don’t mean complaints about having to do the report, or complaints about this report’s theme either! Speaking of themes, here’s some more eye candy, in the form of Chris Jericho! Y2J and I already know about the complaints that X and Yhave received, and the ones that A and B have recently been dealing with, but we’re looking for any other complaints for the quarter 1 January to 31 March. One of the admin girls was rather impressed, telling me that she thought she was starting to look forward to my report emails now, although some disputed my definition of "candy"! But what really has me tickled is that our other site ran an event on the weekend that has been getting lots of great feedback emails, and the team leader there sent one down to share with us in Brisbane. The thing that absolutely cracked me up was the fact that she included the picture above! Even the boss laughed about that one! I told her she had just made my day, and she laughed and said I was "affecting" her, and that she'd been having nightmares about Triple H!! This is just brilliant . 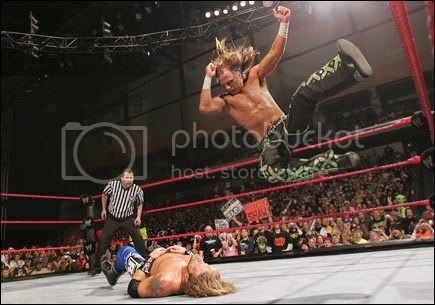 . . she went searching for a pic of a wrestling slam, and happened to pick one of Shawn Michaels. Guess who's going to be the featured beefcake for the next email?